Welcome to the new DCI.org! Drum Corps International is very pleased to welcome fans and followers of drum corps from throughout the world to our new online home. With this "re-launching" of DCI.org, we hope to provide our visitors with a new and engaging way to find information and experience multimedia on the Web, highlighting the world's most elite and exclusive marching music ensembles. Daily updates of the latest drum corps news, official scores, dynamic content, streaming media, and enhanced features come together to make DCI.org your definitive authority for everything drum corps – during the summer and throughout the year. We hope that everyone will take a look around and enjoy the new DCI.org This new Web site is designed to give the seasoned drum corps fan and the first time visitor an easy, fun and efficient way to learn about the amazing world of Drum Corps International and its world-class member organizations. Many of the favorite features from the previous DCI.org site have been updated, and a range of new features have been added. Fans will enjoy WebCasts, enhanced corps information with video clips and the latest news, optimized ticket and show pages, as well as the introduction of the "DCI Fan Network," (formerly known as the DCI Season Pass) providing special "members-only" access and discounts on multimedia. "I can't think of a better way to kick off our 35th anniversary season than with the launch of the new DCI.org," said Executive Director and CEO Dan Acheson. "It is our hope that our network of fans will be as delighted as we are with the improved user functionality, expanded information, and bright new look of our home on the internet." Old and new versions of Drum Corps International's official Web site, DCI.org. 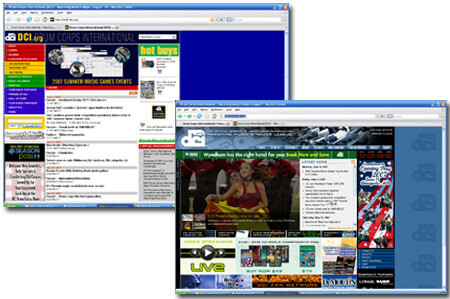 The debut edition of DCI.org was launched in December 1995, and underwent many renovations through 2002, when it was last redesigned. With the creation of this new edition, a brand new look for DCI.org is born again. "This redesign has been several years in the making, and I think fans will be pleasantly surprised with the new features we have incorporated," said Senior Web Developer Ricky Fritzsching. "We hope that everyone will take a look around and enjoy the new DCI.org, as we look forward to the start of another incredible season of drum corps excitement."